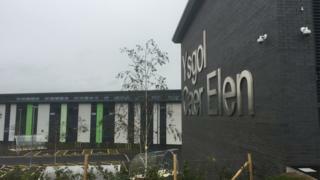 A new £28.1m Welsh medium school has opened its doors for the first time in Pembrokeshire. Ysgol Caer Elen is the county's second medium comprehensive outside the Welsh-speaking heartland of north Pembrokeshire. The all-through facility in Haverfordwest will welcome students aged three to 16. Ysgol Gymraeg Glan Cleddau closed on 31 August to make way for the new school. Ysgol Caer Elen has capacity for 315 primary pupils and another 600 in the secondary part. There are also 45 places at the school's nursery and another 24 in the Cylch Meithrin.